On Tuesday, January 15, 2019, Khadija Ismayilova, an internationally renown Azeri investigative journalist and Honorary Member of PEN Canada, announced via social media that she was joining her countryman, Mehman Huseynov, in a hunger strike he began in prison on December 27. Huseynov is protesting new charges brought against him by the government just months before he finishes a two-year prison term for charges his supporters believe were politically motivated. Ismayilova is only the latest and perhaps most recognized participant in the hunger strike. Members of opposition parties have joined her, as have political prisoners in prisons around Baku. One of the participants is Rashad Ramazanov. Since October 2016, as part of PEN Canada’s Advocates Program, I have been writing postcards to Rashad on a regular basis. Rashad is serving a nine-year prison sentence on charges of “illegal possession and sale of drugs.” He is almost in the sixth year of his sentence. Rashad is well known in Azerbaijan for his social media posts critical of the ruling Aliyev regime. PEN considers the charges against Rashad politically motivated and Human Rights Watch has documented the use of bogus drug charges to silence government critics in Azerbaijan. I have never received a reply in the mail to one of my cards from Rashad, but I know he gets most of them. His wife and I are in frequent contact via WhatsApp, a messaging application. She visits him regularly in prison and he gives her all of the mail he receives for safekeeping. She takes pictures of what he receives and uploads them to our chat. It has become an archive of supportive notes from around the world. Last year Rashad received over 150 cards as part of PEN Canada’s birthday wishes campaign for him. That the Azeri government drop all charges against political prisoners who are about to complete their sentences. That all journalists, bloggers, political prisoners, and activists for freedom of expression in the country be immediately and unconditionally released. That Azerbaijan adopt a “zero political prisoners policy,” including the review of all pending political prisoners’ cases in cooperation with independent, international human rights organizations. I am deeply concerned about this development and the potential consequences it may have on Rashad’s health and the well being of his young family. He has two children who are eleven and five and a half. 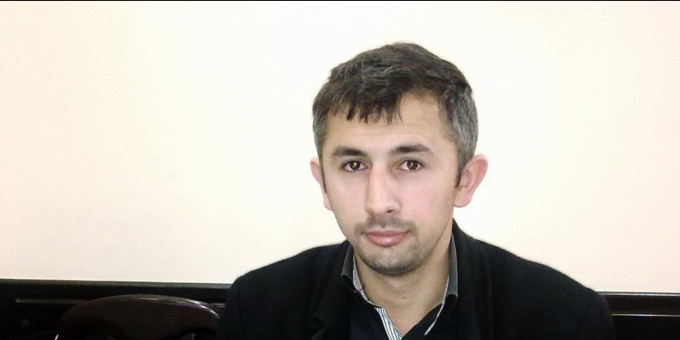 As fellow members and supporters of PEN, I implore each of you to write a note of support to Rashad and raise concern about his case with the Canadian diplomatic mission to Azerbaijan and the embassy of Azerbaijan in Ottawa. Please take a photograph of any postcard you send Rashad and email it to bdecaires@pencanada.ca so that we can add it to our record of all advocacy done on behalf of Rashad. Please do the same for any letters or emails you write to diplomatic officials on Rashad’s behalf. Send a letter or email of concern for Rashad’s wellbeing to the Azeri diplomatic mission in Ottawa and ask for Rashad’s immediate and unconditional release.